If you've been on Twitter at all over the last week or two, you probably had an image of a boy holding his hand out to a butterfly crammed into your feed over and over. The meme has actually been around since 2011, but it has just recently been refreshed with text over the objects a bit like how the Distracted Boyfriend meme is framed. The image is taken from the first season of the anime series The Brave Fighter of Sun Fighbird. 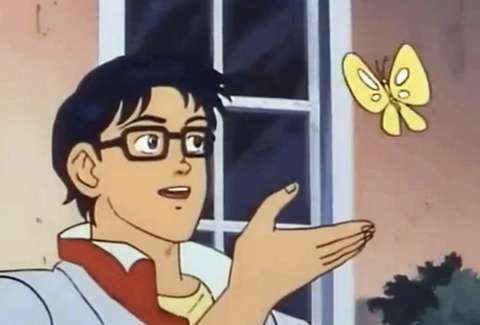 It shows a character extending a hand toward a butterfly and confusing it for a pigeon. It's been used as a meme before to show confusion. It's still doing that, but with a bit of a twist. Know Your Meme credits Twitter user @romiosini with the first use of the "object labeled" version of the meme in late April. Now it's basically being used for everything, but many have used it as an interesting and humorous way to talk about mental well-being. Many of the posts are discussing mental health, which makes it an interesting meme even if there are still plenty of versions that are about farts and Pokémon. Then there are some that take it in another direction and really rise to the occasion.